A press release was just published for Miamism.com. I’d like to invite my readers to check out the website. It provides, among other things, insight into buying and selling homes as well as purchasing in condo hotels. The content is evolutionary and substantive. Ines, a Realtor specializing in the Miami Shores market, is a friend of Boom or Bust, and I wish her and her husband Rick continued success. On another note, Jared Beck, a “Harvard lawyer in the Magic City”, has started a law blog, which shares his thoughts on a number of topics associated with law, litigation, political theory, and starting a law firm. New blog, great concept and content thus far. I recommend checking it out. Miami River area development is challenging to track and this post is definitely not my attempt to do so but a brief prelude to an incoming River profile. I recently stumbled upon an interesting section of the River that caught my attention. It’s where the river splits in two. In the south side of the split, there is an old townhouse development called the River Club. Image: Rear side of River club (left) and the abandoned pool (right). These are inexpensive town house units facing the River. 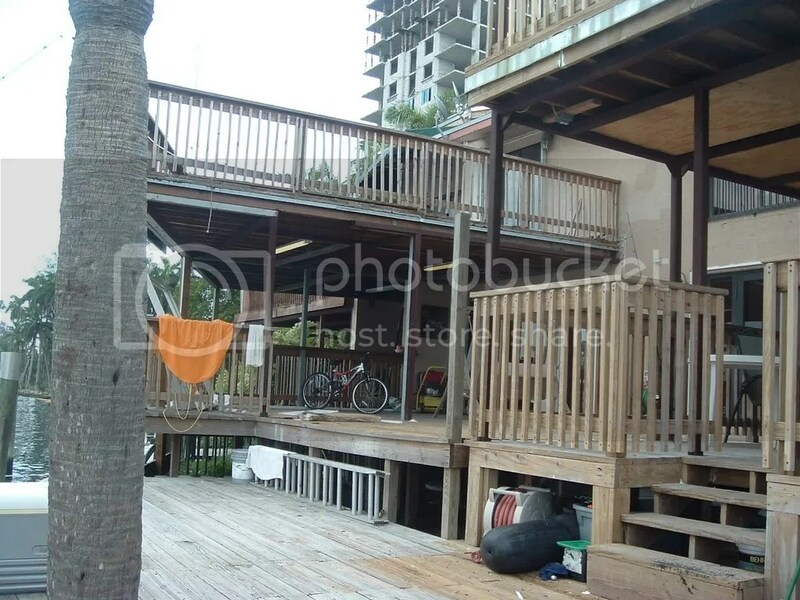 This charming river side community is livable but deteriorated. There seems to be little hope of it changing. 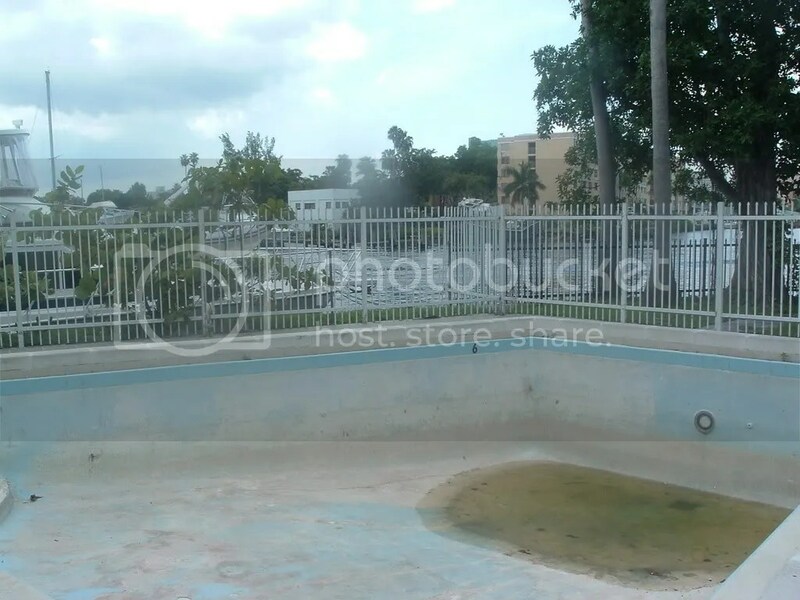 The pool is dried up and graffiti splattered. There is nothing in the way of landscaping or pleasant amenities. 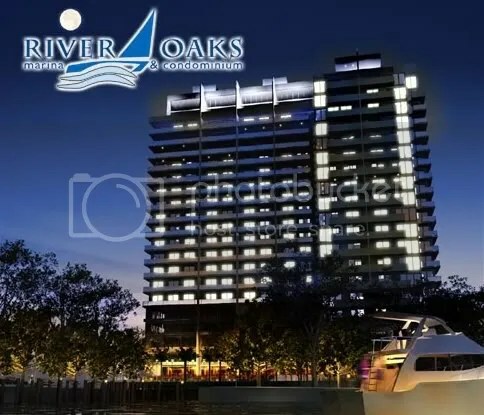 However, it sits right on the river fork, is a short walk away from a beautiful riverfront park, and has new construction is surrounding it (Terrazas River Park Condo and River Oaks Condo). Let’s take a look. 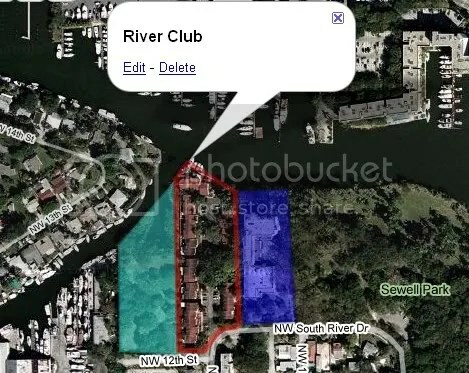 Image: The river club is outlined in red. Terrazas on the River (right) is highlighted in dark blue and River Oaks Condo (left) is highlighted in light blue. Both are new construction residential high rise developments. Sewell Park is clearly visible as well. 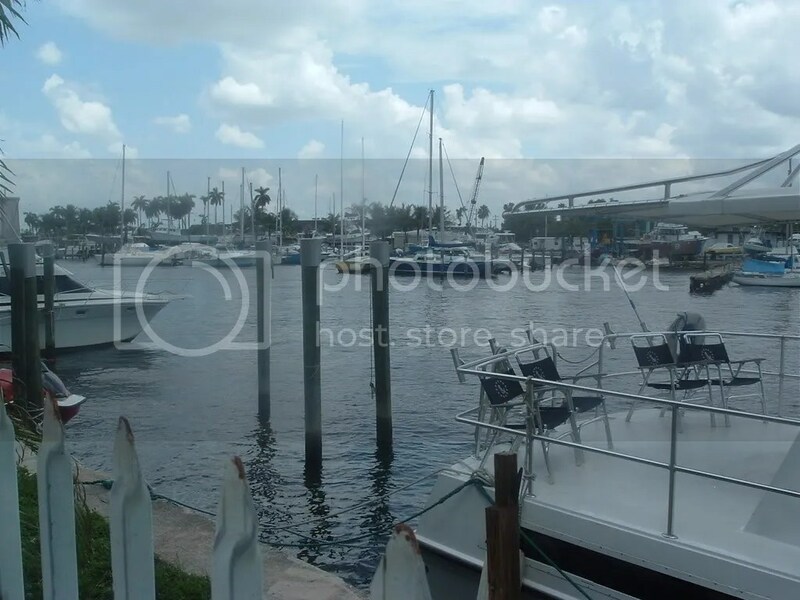 The River Club is symbolic of under appreciation along the Miami River. I haven’t factored in the full scope of new construction in the area and therefore cannot present a comprehensive picture. Look forward to that soon. 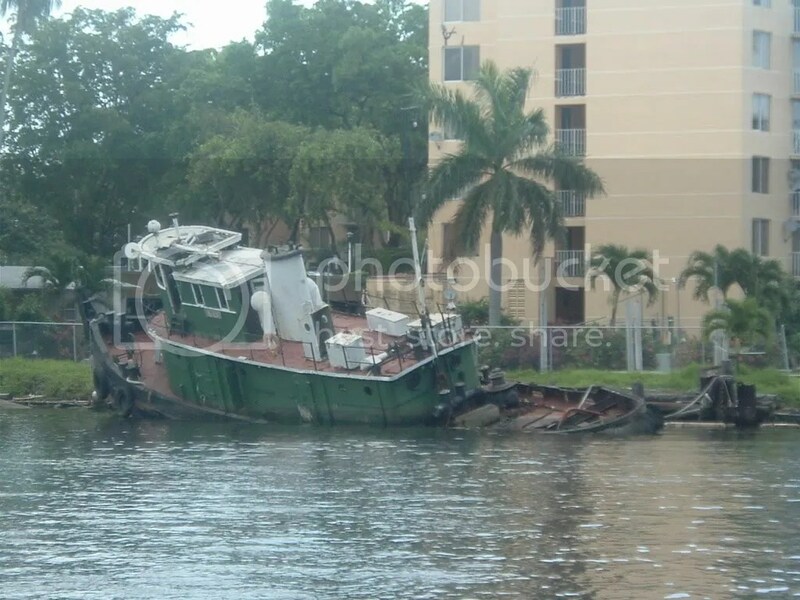 Image: Miami River sunken boat. I know this is an environmental hazard or liability of some kind. It’s been there for months, at least. Of course, no one cares. A Slice of Miami in the West Bank? According to BBC News, a town called Marzaa Sharqiya north of Ramallah is considered the Palestinian interpretation of Miami. The report, although not entirely relevant to what Miamians care about, does offer a perspective of Miami as a lifestyle concept. 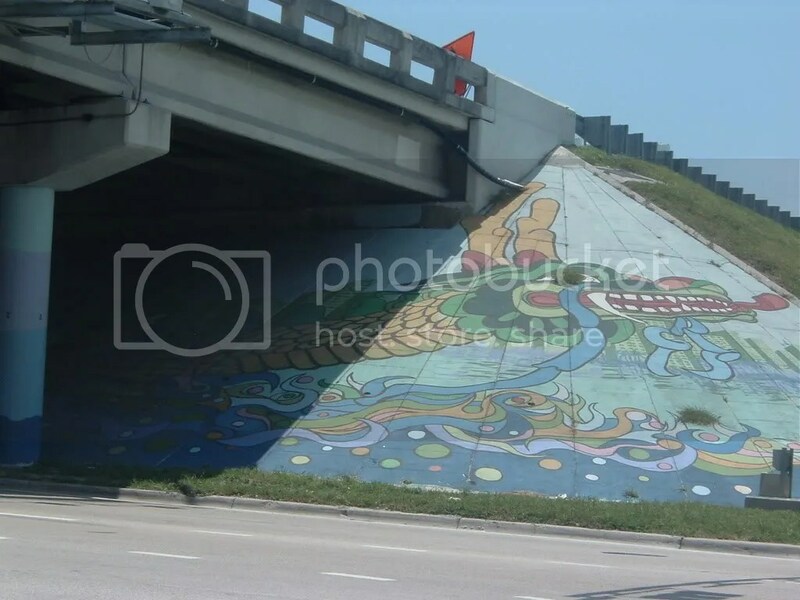 Overpasses are an eyesore, but is painting them with dragons, unidentifiable animals, polka dots, and floral patterns a way of making them any less unappealing? Who’s doing the painting? Who’s paying for it? Surely it isn’t prisoner labor. I appreciate the effort but can’t help but sense the utter futility in continuing painting them, but can’t come up with any alternatives. What’s next, murals of country vistas and waterfalls? 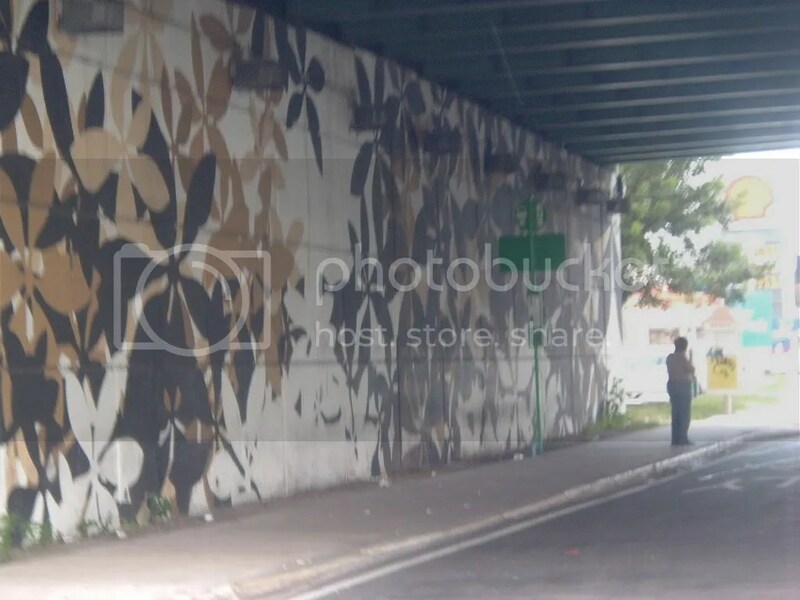 Maybe Britto can chip in with his own pop art overpass. 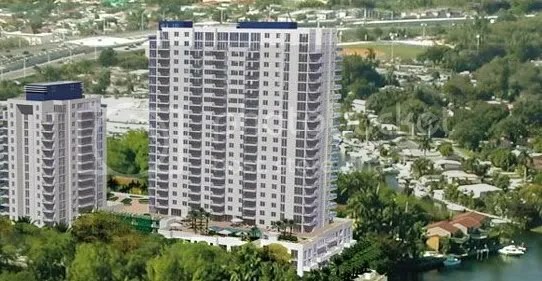 A 120,000 square foot multi-level retail complex planned for 32nd street and Biscayne Blvd is now leasing. 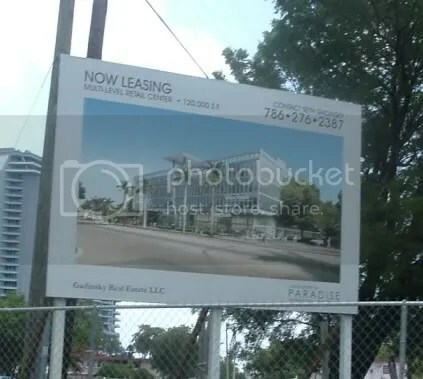 The project, which is unnamed in the display sign, is located directly south of the proposed 3333 Biscayne office/condo development. 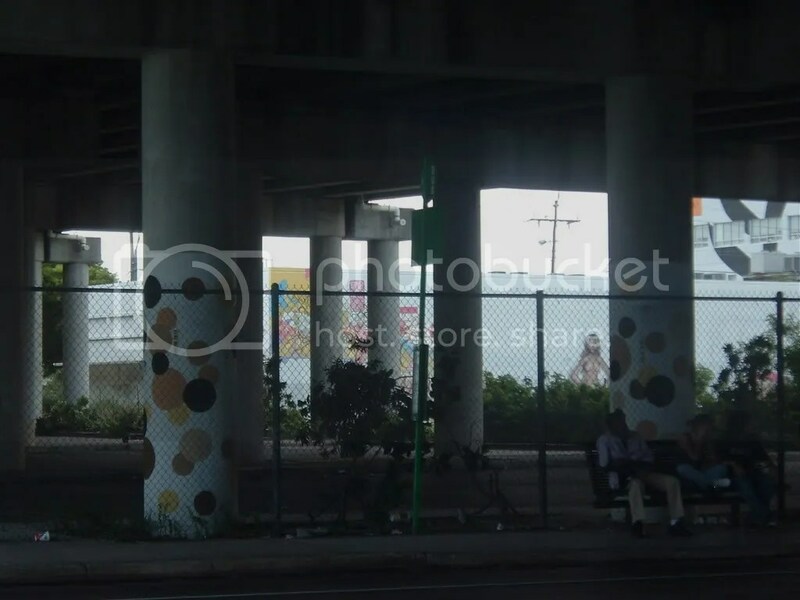 With the advent of so many high density residential units and the absence of new retail on Biscayne Blvd. (except the rapidly filling spaces at Cite), Uptown has become an area ripe for retail activity. Seth Gadinsky is the broker assigned to the project. 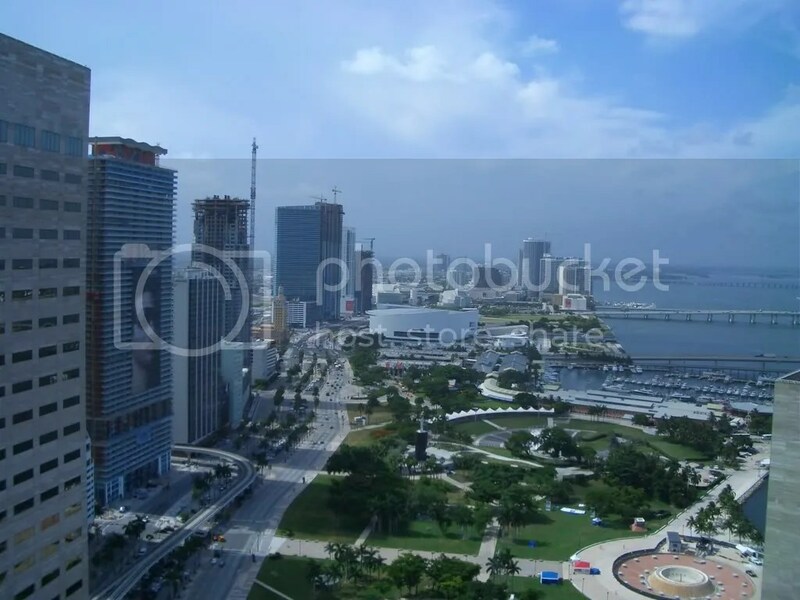 The project is within walking distance from Midtown Miami and the Design District. 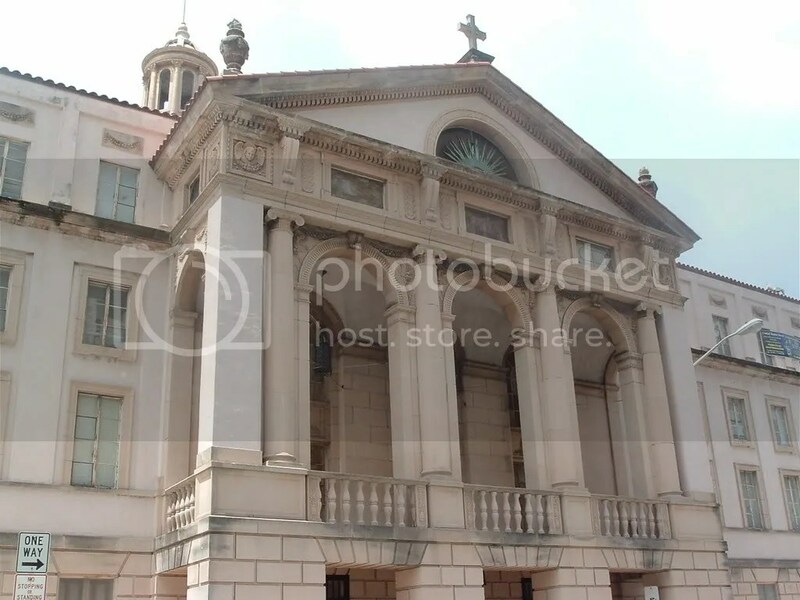 Central Baptist Church is an excellent example of Neo-Classical design adapted to the Florida climate. Particularly noteworthy is the circular plan, which allows natural ventilation to keep the interior cool during the summer. 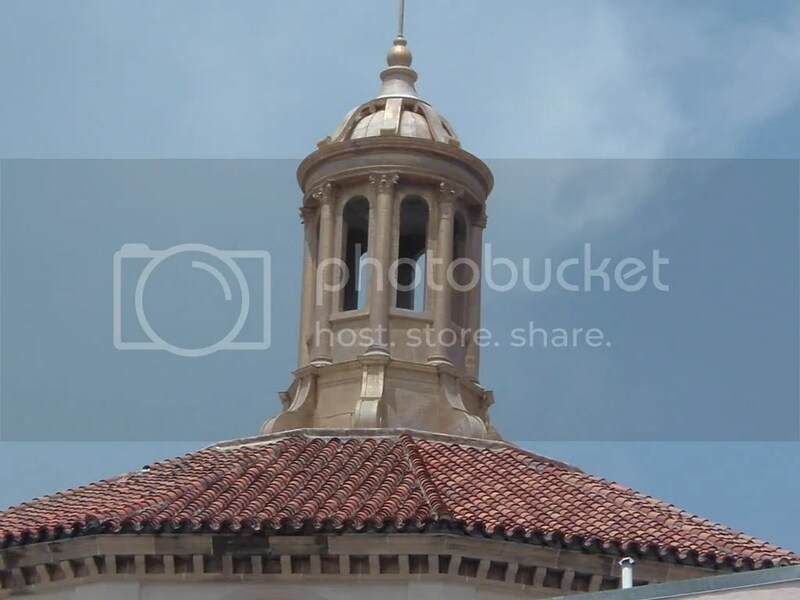 The church, originally known as First Baptist Church, was organized two days before Miami incorporated in 1896 and houses the oldest Baptist congregation in the city. It remains one of the last active churches to hold regular services in the downtown central business district. Central Baptist Church was listed in the National Register of Historic Places in 1989. Interestingly, this is not Miami’s first major church (that still stands). That right is reserved for the Gesu Church, which will be highlighted later. 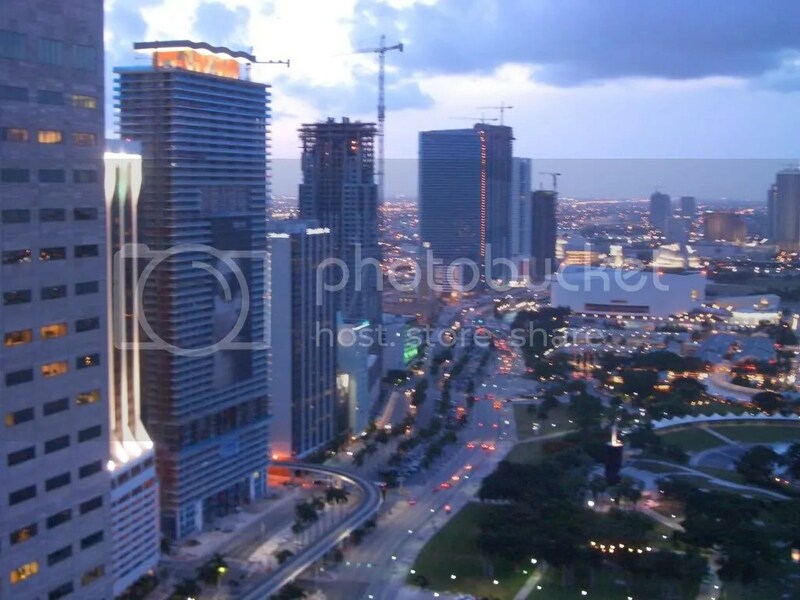 As you can see, the 50 Biscayne crown is not illuminated in the image above. 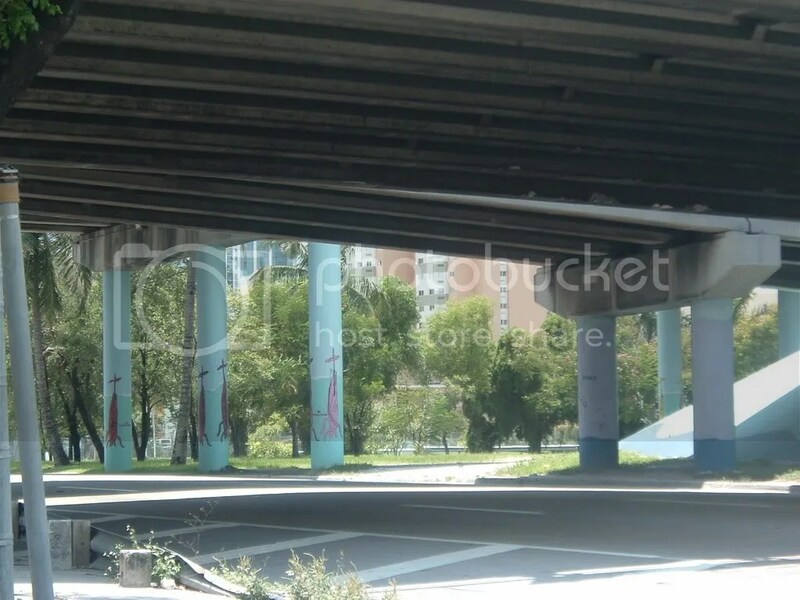 Most of what you see in terms of structures in the images above is attributed to the construction boom. 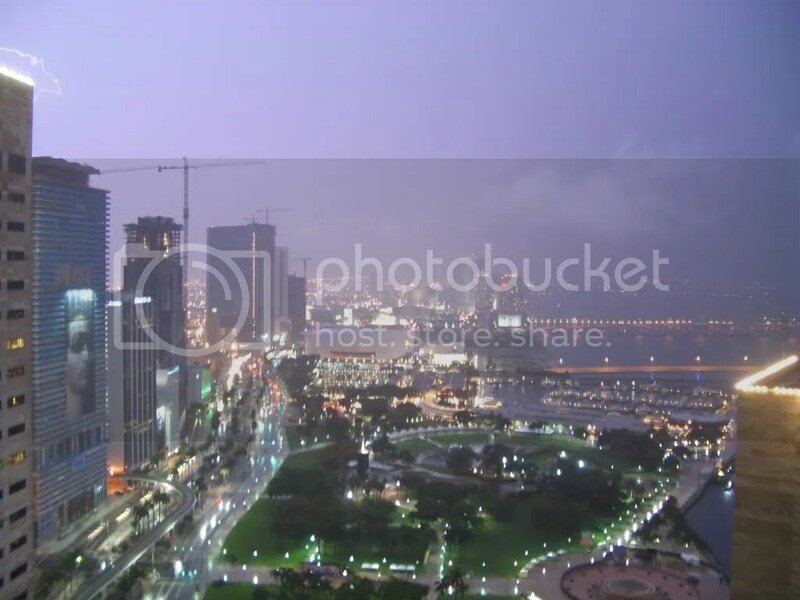 – Thanks to Alex for sending BoB the view from his sky pad. A 2 percent decline in Miami moved median home prices to $378,000 from 371,600. The number of homes sold went down to 469 from 884, a 47 percent decrease.